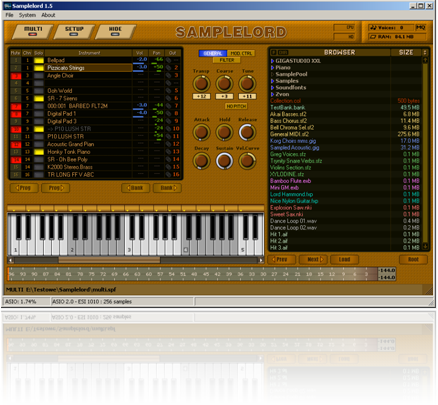 Samplelord is a sample player which can work as a VSTi plug-in or standalone application. It can load different sounds in different formats in the same Multi-Patch and play these in real-time just like a hardware sound module. Fast engine and very low CPU usage thanx to code optimizations. 8, 16, 24, 32-bit, 32-bit float, 64-bit sample support at any samplerate on the fly. Can load GIG, SF2, FXP, NKI, EXB, WAV, AIFF files, plus own Native Format and play these directly from disk. No (re)conversion and (re)saving is done to hard disk during file loading, files are loaded directly into RAM memory. 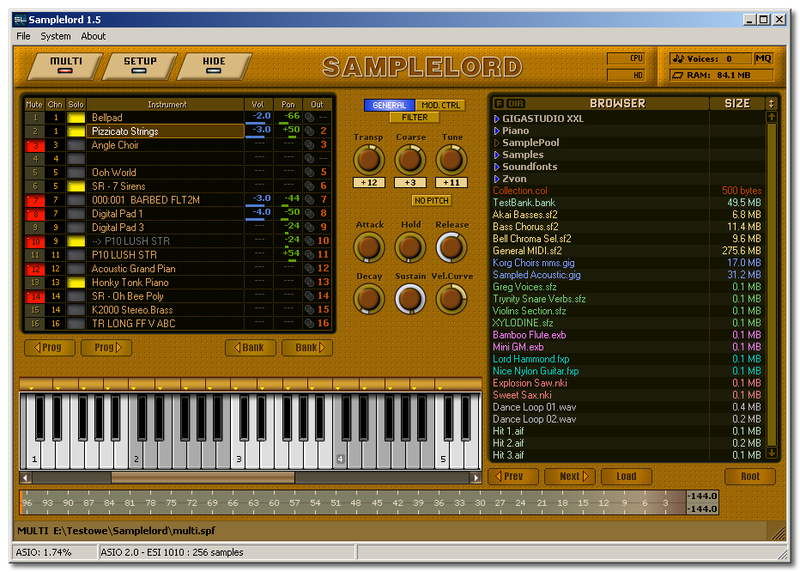 Other formats can be accessed using our Extreme Sample Converter software sold separately or in a bundle with SampleLord. Runs as a standalone application under Windows Operating systems. * - Make sure that VST host software supports 32-bit vst plug-ins. Test a demo version! 16 MIDI inputs freely configurable with custom routing to loaded instruments. 16 stereo audio outputs with full control over all multi parts and audio output routing. Easy-to-use Browser gives you access to your sounds on any hard disk. The Browser has options to filter file types and selected formats. Supports Drag and Drop functions inside. All instances share the same program resources. Each instance adds 2048 voices resulting in nearly unlimited polyphony. Smooth parameter's automation via MIDI.